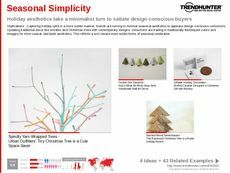 Find Better Ideas, Faster ® with a custom festive decor trend report, our PRO Dashboard and 80+ categories of premium trend reports. 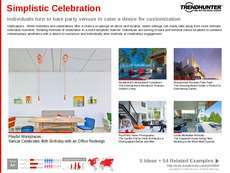 The Festive Decor Trend Report includes decorations, wall ornaments and table settings for parties, holidays and birthdays. Christmas decor like tree ornaments are experiencing a shift to eco-friendly materials that can be found in reusable packaging that doubles as table or wall art. 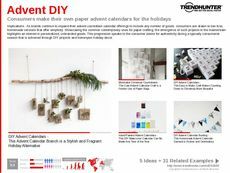 Birthday streamers and DIY advent calendars are fun for children, while maker culture is taking over more mature party decor as well. 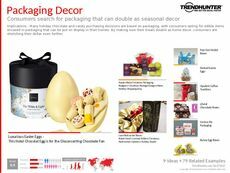 This report is great for interior decorators, decor designers and home decor retailers who are seeking ideas for Christmas, holiday and seasonal decorations. Birthday and party supply retailers will also find these products and patterns useful, as well as the marketing teams that collaborate with these businesses. The Festive Decor Trend Report includes many designs and products to make the home or office more festive during holidays and celebrations.